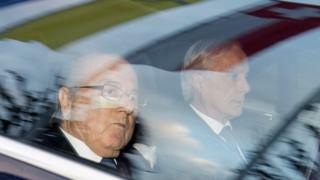 Fifty Swiss bank accounts allegedly linked to world football governing body Fifa have been frozen. US officials believe "corruption money" may have been moved through the now frozen accounts, the Swiss justice ministry said. Between 50m and 100m Swiss francs ($50.1m-100.2m; £34m-£67m) was in them, media reports say. An earlier version of this story incorrectly stated the accounts belonged to Fifa. Mr Blatter, who is due to depart from Fifa on 26 February, strongly pleaded his innocence over corruption allegations, his lawyer said. The ethics investigation was launched following the decision by the Swiss attorney general to instigate criminal proceedings against Mr Blatter over a $2m (1.34m; €1.84m) payment to European soccer chief Michel Platini in 2011. Both men deny any wrongdoing. Along with Mr Platini, Mr Blatter was suspended in October from participating in all soccer-related activity for 90 days pending a full inquiry into their conduct. Some observers have highlighted the irony of Mr Blatter's appearance before the committee, given it was he who in 2012 gave it powers to become far tougher and more independent. He now argues that it does not have the power to remove an elected president and has complained of being the victim of an "inquisition". It is said that numerous Fifa members are believed to have accounts in Switzerland, including South American confederation head Nicolas Leoz, who had as many as 12. Correspondents say that if the committee rules against Mr Blatter, he could be banned from football for years. Earlier this week, he used his own stationery to write to Fifa's 209 member state associations to proclaim his innocence. On Wednesday lawyers for Mr Platini said they would boycott an ethics committee hearing into allegations of corruption against him on Friday. Lawyers for the Frenchman said they believed the verdict had already "been announced".